Growth: western United States and Canada; introduced to UK, Australia, and New Zealand. 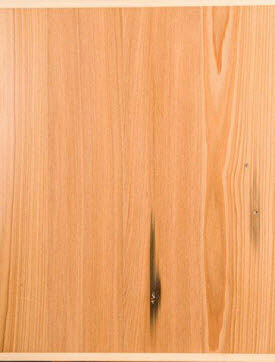 Appearance: Generally straight, sometimes wavy grained with a medium to fairly coarse texture. Yellowish to orange-red heartwood and whitish to reddish white sapwood. Typically free of knots. Physical Props: Quite variable in terms of color, weight, strength and working properties but frequently of average weight with moderate to high strength, moderate shock resistance, and high stiffness. Somewhat brittle and susceptible to splitting (poor for steam bending). Uses: Plywood, paneling, trim, cooperage, tanks, ship knees, silos, studs, joists, laminated beams and arches, boxes, crates, pallets, and flooring.